This article covers logistic regression - arguably the simplest classification model in machine learning; it starts with basic binary classification, and ends up with some techniques for multinomial classification (selecting between multiple possibilities). The final examples using the softmax function can also be viewed as an example of a single-layer fully connected neural network. This article is the theoretical part; in addition, there's quite a bit of accompanying code here. All the models discussed in the article are implemented from scratch in Python using only Numpy. Using a linear model for binary classification is very similar to linear regression, except that we expect a binary (yes/no) answer rather than a numeric answer. And then make a binary decision based on the value of . A simple way to make a decision is to say "yes" if and "no" otherwise. Note that this is arbitrary, as we could flip the condition for "yes" and for "no". We could also compare to some value other than zero, and the model would learn equally well . It helps seeing a graphical example of how this looks in practice. As usual, we'll have to stick to low dimensionality if we want to visualize things, so let's use 2D data points. We can play with some sample points to see that everything "to the right" of the line gives us , and everything "to the left" of it gives us . How do we find the right for a classification problem? 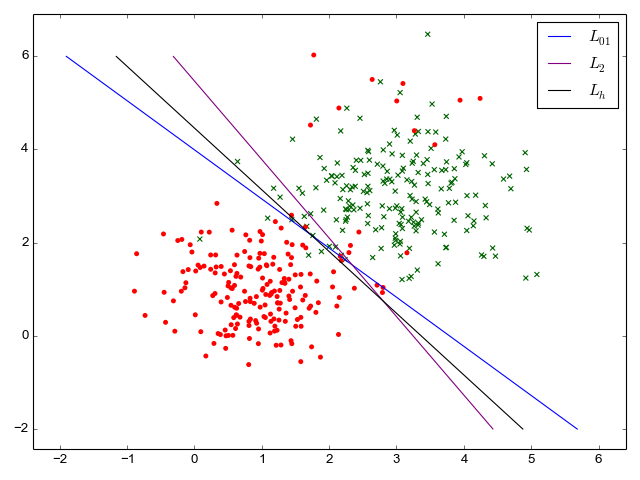 Similarly to linear regression, we're going to define a "loss function" and then train a classifier by minimizing this loss with gradient descent. However, here picking a good loss function is not as simple - it turns out square loss doesn't work very well, as we'll see soon. Let's start by considering the most logical loss function to use for classification - the number of misclassified data samples. This is called the 0/1 loss, and it's the true measure of how well a classifier works. Say we have 1000 samples, our classifier placed 960 of them in the right category, and got the wrong answer for the other 40 samples. So the loss would be 40. A better classifier may get it wrong only 35 times, so its loss would be smaller. Unfortunately, the 0/1 loss is fairly hostile to gradient descent optimization, since it's not convex. This is easy to see intuitively. Suppose we have some that gives us a margin of -1.5. The 0/1 loss for this margin is 1, but how can we improve it? Small nudges to will still give us a margin very close to -1.5, which results in exactly the same loss. We don't know which way to nudge since either way we get the same outcome. In other words, there's no slope to follow here. That's not to say all is lost. Some work is being done with optimizing 0/1 losses for classification, but this is a bit outside the mainstream of machine learning. Here's an interesting paper that discusses some approaches. It's fascinating for computer science geeks since it uses combinatorial search techniques. The rest of this post, however, will use 0/1 loss only as an idealized limit, trying other kinds of loss we can actually run gradient descent with. It penalizes correct classification as well, in case the margin is very positive. This is not something we want! Ideally, we want the loss to be 0 starting with and for all subsequent values of m.
It very strongly penalizes outliers. One sample that we misclassified badly can shift the training too much. It doesn't penalize correct classification after . It penalizes incorrect classifications, but not as much as square loss. we can actually examine the loss in its very close vicinity and find a slope we can use to improve the loss. So, unlike 0/1 loss, it's amenable to gradient descent optimization. There are other loss functions used to train binary classifiers, such as log loss, but I will leave them out of this post. This is a good place to mention that hinge loss leads naturally to SVMs (support vector machines), an interesting technique I'll leave for some other time. Where is the learning rate. The only missing part remaining is computing the gradients for the square and loss hinge functions we've defined. In addition, I'm going to add " regularization" to the loss as a means to prevent overfitting for the training data. Regularization is an important component of the learning algorithm. 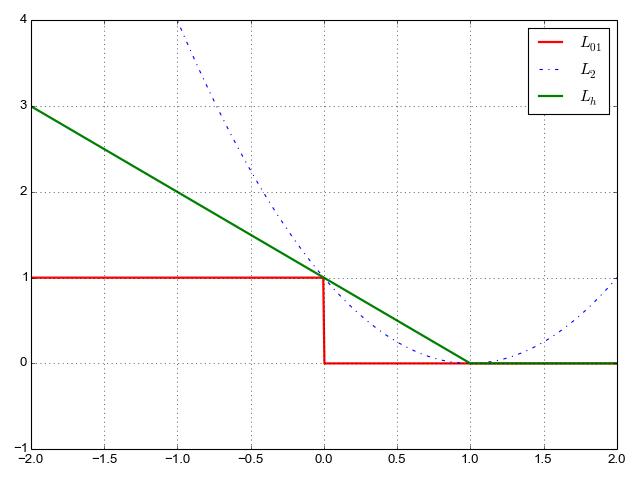 regularization adds the sum of the squares of all parameters to the loss, and thus "tries" to keep parameters low. This way, we don't end up over-emphasizing one or a group of parameters over the others. This is assuming we have k data points (n+1 dimensional) and n+1 parameters (including the special 0th parameter representing the bias). The total loss is the square loss averaged over all data points, plus the regularization loss. is the regularization "strength" (another hyper-parameter in the learning algorithm). With this in hand, it's easy to compute the gradient of loss. The data points for which the correct answer is positive (y=1) are the green crosses; the ones for which the correct answer is negative (y=-1) are the red dots. 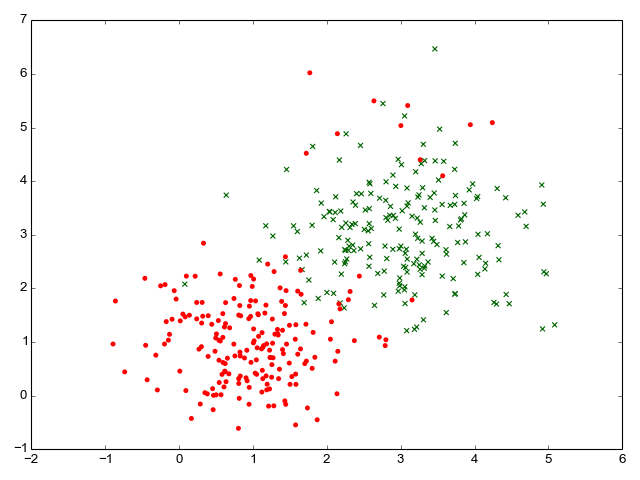 Note that I include a small number of negative outliers (red dots where we'd expect only green crosses to be) to test the classifier on realistic, imperfect data. The 0/1 loss - number of misclassified data items - for this set of parameters is 20 out of 400 data items (95% correct prediction rate). 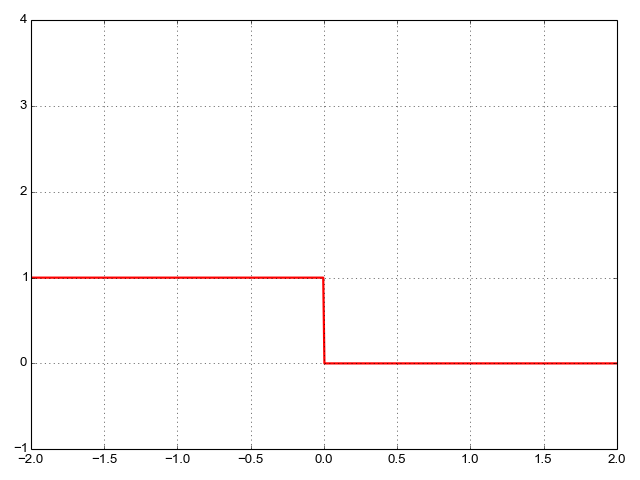 Next, the code trains a classifier using square loss, and another using hinge loss. I'm not using regularization for this data set, since with only 3 parameters there can't be too much selective bias between them; in other words, . The MNIST dataset is the "hello world" of machine learning these days. It's a database of grayscale images representing handwritten digits, with a correct label for each of these images. MNIST is usually employed for the more general multinomial classification problem - classifying a given data item into one of multiple classes (0 to 9 in the case of MNIST). We'll address this in a later section. Here, however, we can experiment with training a binary classifier on MNIST. 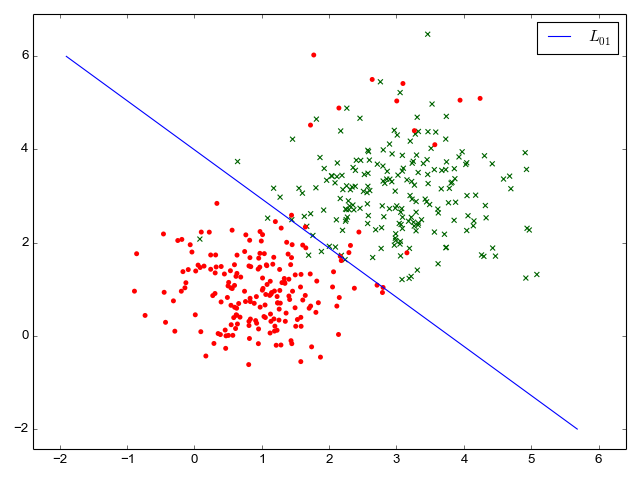 The idea is to train a classifier that recognizes some single label. For example, a classifier answering the question "is this an image of the digit 4". This is a binary classification problem, since there are only two answers - "yes" and "no". Here's a code sample that trains such a classifier, using the hinge loss function (since we've already determined it gives better results than square loss for classification problems). Then all we have is a binary classification problem, albeit one that is 785-dimensional (784 dimensions for each of the 28x28 pixels in the input images, plus one for bias). Visualizing the separating contours would be quite challenging here, but we can now trust the math to know what's going on. 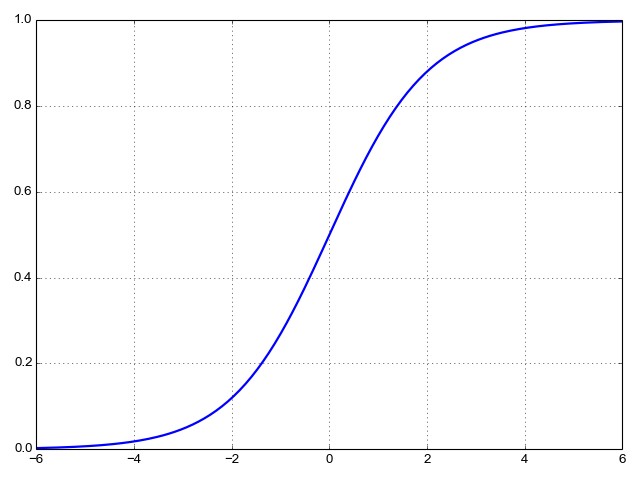 Other than this, the code for gradient descent is exactly the same as for the simple 2D synthetic data shown earlier. My goal here is not to design a state-of-the-art machine learning architecture, but to explain how the main parts work. So I didn't tune the model too much, but it's possible to get 98% accuracy on this binary formulation of MNIST by tuning the code a bit. While 98% sounds great, recall that we could get 90% just by saying "no" to every digit :-) Feel free to play with the code to see if you can get even higher numbers; I don't really expect record-beating numbers from this model, though, since it's so simple. So far the predictors we've been looking at were trained to return a binary yes/no response; a more useful model would also tell us how sure it is. For example "what is the chance of rain tomorrow", rather than "will there be rain, yes or no"? The probability gives additional information. "90% chance of rain" vs. "56% chance of rain" gives us additional information over the binary "yes" for both cases (assuming a 50% cutoff). Moreover, note that the linear model we've trained actually provides more information already, giving a numerical answer. We choose to cut it off at 0, saying yes for positive and no for negative numbers. But some numbers are more positive (or negative) than others! And now, the answer we get can be interpreted as a probability between 0 and 1 (without actually touching either asymptote) . We can train a model to get as close to 1 as possible for training samples where the true answer is "yes" and as close to 0 as possible for training samples where the true answer is "no". This is called "logistic regression" due to the use of the logistic function. Earlier in this post, we've seen how a number of loss functions fare for the binary classifier problem. It turns out that for logistic regression, a very natural loss function exists that's called cross-entropy (also sometimes "logistic loss" or "log loss"). 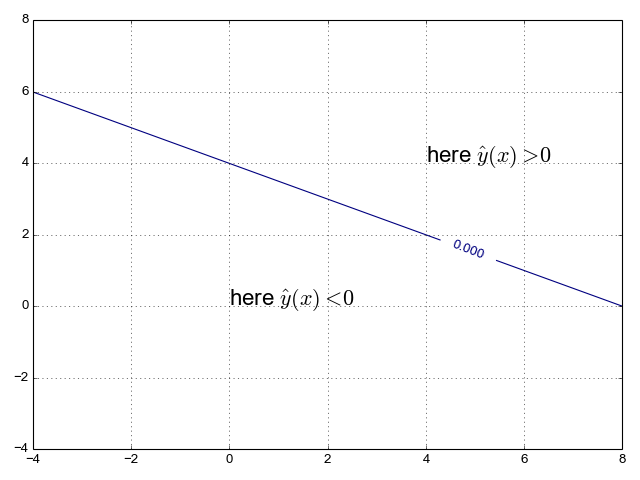 This loss function is derived from probability and information theory, and its derivation is outside the scope of this post (check out Chapter 3 of Michael Nielsen's online book for a nice intuitive explanation for why this loss function makes sense). Let's unravel this definition, step by step. The parenthesized superscript denotes, as usual, the ith input sample. t runs over all the possible outcomes; is the actual probability of outcome t and inside the log we have the conditional probability of this outcome given the regression parameters - in other words, this is the model's prediction . The second possibility has because we define to predict the probability of the answer being +1; therefore, the probability of the answer being -1 is . Using these formulae, we can train a binary logistic classifier for MNIST that gives us a probability of some input image being a 4, rather than a yes/no answer. The binary MNIST code sample trains either a binary or a logistic classifier using a lot of shared infrastructure. The model clearly made a mistake here, but can we know how wrong it was? It would be hard to know with a binary classifier that only gives us a yes/no answer. However, when I run a logistic regression model on the same image, it tells me it is 53% confident this is a 4. Since our cutoff for yes/no is 50%, this is quite close to the threshold and thus I'd say the model didn't make a huge mistake here. The previous example is a great transition into the topic of multiclass logistic regression. Most real-life problems have more than one possible answer and it would be nice to train models to select the most suitable answer for any given input. Our input is still a vector x, but now instead of assigning +1 or -1 as the answer, we'll be assigning one of a fixed set of classes. If there are T classes, the answer will be a number in the closed range [0..T-1]. The good news is that we can use the building blocks developed in this post to put together a multiclass classifier. There are many ways to do this; here I'll focus on two: one-vs-all classification and softmax. For each class we train a logistic classifier where we set t as the "correct" answer, and the other classes as the "incorrect" answers (+1 and -1 respectively). The result of each such classifier is the probability that an input sample belongs to class t.
Given a new input, we run all T classifiers on it and the one that gives us the highest probability is chosen as the true class of the input. As a completely synthetic example to make this clearer, suppose that T=3. We take the training data and train 3 logistic regressions. In the first - , we set 0 as the right answer, 1 and 2 as the wrong answers. In the second - we set 1 as the right answer, 0 and 2 as the wrong answers. Finally in the third - we set 2 as the right answer, 0 and 1 the wrong answers. Therefore, the chosen class is 0. These class/index numbers are just labels of course. They can stand for anything depending on the problem domain: medical condition names, digits and so on. This approach doesn't require any additional math over what we've already covered in this post. This multinomial MNIST classifier code sample implements it. The error rate it achieves is ~11%, similar to what LeCun's 1998 paper achieved with a simple linear classifier. 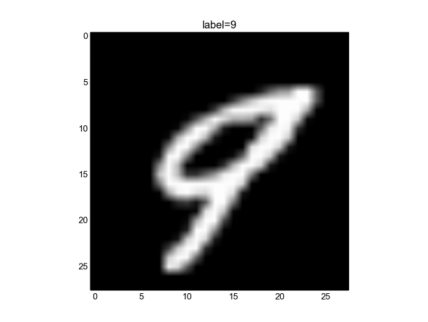 Much better than 11% can be done for MNIST, even with a single-layer linear model. However, my model is very far from the state of art - there's no preprocessing, no artificially-enlarged training set, no adaptive learning rate; I didn't even spend time tuning the hyperparameters (regularization type and constants, learning rate, batch size etc.) The goal here was just to demonstrate the basics of logistic regression, not to compete for the state of the art in MNIST. It is very useful for multiclass classification, since it lets us generate probabilities of the input belonging to one of N classes. Similarly to the OvA case, here we have to train 10 different parameter vectors, one for each digit. However, unlike OvA, this training doesn't happen separately but occurs at the same time. Instead of training a model to find a single parameter vector each time, we train a parameter matrix once. I've chosen the number of classes to be 10 to reflect MNIST where we have 10 possible digits to assign to every input. In MNIST N is 785 (784 for each of 28x28 pixels in the image, plus one for bias). "Logits" is a common name to assign to the output of a fully connected layer (which is what we have with the matrix-vector multiplication in the first stage); the logits are arbitrary real numbers. The softmax function is responsibe for squeezing them into the range of probabilities (0, 1) and making sure they all add up to 1. This diagram shows what happens to a single input as it goes through the model. In a realistic program, there will be another dimension - the batch dimension, used to vectorize the computation over a whole batch of inputs. For training this model, we need a loss function. It turns out cross-entropy is a very popular loss function to use for softmax. In the softmax post I also covered how to compute the gradient of cross-entropy on a softmax, so we're all set to write some code: the full sample is here. Running it on MNIST for a couple of minutes produces a 9.5% error rate - slightly better than the OvA approach, but very close. This is to be expected, since OvA and softmax compute very similar results (finding the maximal probability from a set of probabilities), just in a different way. Softmax regression is much faster, however, since we can vectorize the training for all 10 digits in the same run. In this post I'm following many of the conventions established in my post on linear regression. In particular, by construction so that is the bias. Why? Because we have the bias as part of the model, so any constant offset can be absorbed into the learned bias. Note that this outcome is, once again, somewhat arbitrary. We could find another plane that intersects the x/y axis on the same line, and get a different classification. For example, if we flip the sign of all the elements of , we get the same intersection line. In that case, however, values "to the right" of the line give us . Since the labels we attach are arbitrary, this really makes no difference. The only important thing is that we find a line that separates "true" from "false" samples and be consistent with our signs and labels throughout the process. Note that both the loss and the regularization are called . This is a bit confusing, but both are essentially 2nd norms. It's best to ignore the name of the regularization factor and just refer to it as "regularization". I thought it's important to mention initially as there are other kinds of regularization being used for machine-learning algorithms and I wanted to make it clear which one is being used here. As an exercise, play with the code to increase or decrease the number of outliers (the code makes it easily controllable), and observe the effects on the misclassification rates of the different loss functions. 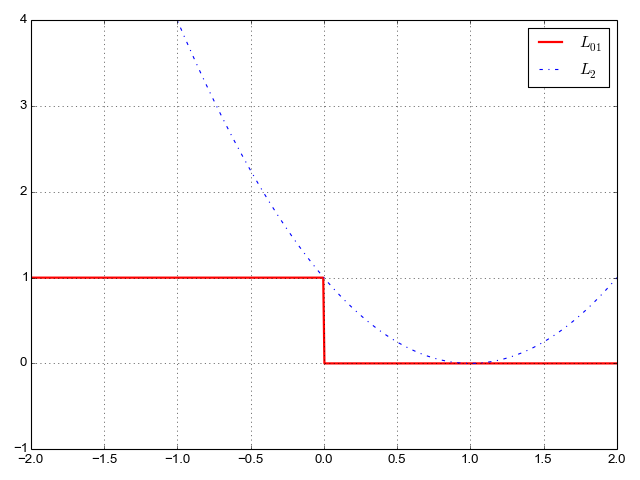 Note that using the logistic function on the model's output is strictly a generalization of the binary classifier. We can still make a binary interpretation of the result if we're so inclined, interpreting as "yes" and otherwise as "no". In terms of the input to , this means "yes" for which is exactly the formulation we've been using for the binary classifier. In essence, cross entropy is computed between two probability distributions. Here, one of them is the "real" distribution observed in the y data. The other is what we predict given X data and our regression parameters . The observed real probability is either 0 or 1 for any given data item, and the corresponding predicted probability is our model's output. I also discussed cross-entropy in the post about softmax. Many resources online condense this formula to a single line without the condition: . I'm avoiding this formulation on purpose, because it requires the possible values of y to be 0 and 1, not -1 and +1. Although it's possible to play with constants a bit to reformulate the -1/+1 case in a similarly condensed fashion, I find the version with the condition more explicit and thus easier to follow, even if it requires a bit more typing. See also my post about the chain rule, where this derivation is shown.